Any philosophical consideration of the politics of debt must perhaps begin with the fact that the entire rhetoric of debt, owing and paying one’s debts, is at once a moral and an economic vocabulary. This point is related to, but opposed to, Nietzsche’s well-known argument in the Genealogy of Morals. Whereas Nietzsche argued that morality, guilt, was simply debt, a payment in suffering for those who could not pay the price, an examination of debt reveals how much paying ones debts, paying one’s bills, is a moral imperative as much as an economic relation. As David Graeber argues even from the standpoint of standard economic theory the positing of debt as some kind of moral duty, as something which can never be dispensed with, runs counter to not only the justification of interest, which is supposedly a compensation based on risk, but the immense apparatus dedicated to the assessment of risk, discerning good and bad risk.The idea of paying one’s debts is nothing other than a moral idea, and idea of an absolute moral obligation transposed into the realm of economy. One could consider this morality to be a slavish one, in that keeps everyone paying their mortgage for a house that is underwater, and paying their student loans without ever getting the job promised by such an education. It would seem then that the political task is a matter of simply separating the morality of obligation from the economy of debt. The knot is a little more tangled than just tossing aside the language of debt entirely, since debt, is the predominant way of expressing social obligations. Graeber has argued that the prehistory of debt, the prehistory that explains the etymology of economics and morality, is based on the obligations that sustain society, between parents and children, husbands and wives, etc. However, these obligations were not monetized. To take a contemporary example, we owe a debt to our parents, but could never pay this back with a check, or doing so would seem offensive. For a long time these non monetized debts sustained social relations and individuals. The recent history of debt is one in which this dependency, at least partially recognized in terms social rights, rights to education, care, etc, have become social debts, entitlements, which are in turn privatized and individualized. The primary sources of debt, especially in the US, are education, housing, and healthcare, are expressions of need, our radical lack of self-sufficiency as human beings. Untying the knot of economics and morality is not a matter of just throwing out the language of debt, but of subtracting dependency from the economy of debt, or in Graeber’s terms, the human economy from the economy. … A rich man gives credit to a poor man whom he considers industrious and decent. This kind of credit belongs to the romantic, sentimental part of political economy, to its aberrations, excesses, exceptions, not to the rule. But even assuming this exception and granting this romantic possibility, the life of the poor man and his talents and activity serve the rich man as a guarantee of the repayment of the money lent. That means, therefore, that all the social virtues of the poor man, the content of his vital activity, his existence itself, represent for the rich man the reimbursement of his capital with the customary interest. Within the credit relationship, it is not the case that money is transcended in man, but that man himself is turned into money, or money is incorporated in him. Human individuality, human morality itself, has become both an object of commerce and the material in which money exists. Instead of money, or paper, it is my own personal existence, my flesh and blood, my social virtue and importance, which constitutes the material, corporeal form of the spirit of money. Credit no longer resolves the value of money into money but into human flesh and the human heart. Such is the extent to which all progress and all inconsistencies within a false system are extreme retrogression and the extreme consequence of vileness. Credit and debt is not some moment of personal evaluation outside of the economy, some moment of values in the calculation of value, but the complete penetration of calculation of value into all of life. There is no longer an opposition between money as an abstract and quantifiable power that renders everything interchangeable and human relations which are always relations of particulars, of particular qualities. Credit and debt are completely particular, complete individuated, but this individuation is not outside of the abstraction of money, but its complete subsumption of the most intimate area of subjectivity. The human economy, the economy of obligations and actions, does not exist as something underneath or beyond the economy of debt, but is thoroughly subsumed by it. As much we could read Marx’s text as a yet another prophetic text by Marx, one that appears to have foretold the era of credit agencies scanning social media sites and Wal-Mart taking out insurance policies on its employees, the important difference is that the penetration of such estimations into the inner details of credit and existence does not take place by an personal evaluation, by a creditor evaluating the cut of a debtor’s jib, but through impersonal and unseen calculations. Do you know your credit score? Or whether your employer has taken out an insurance policy on your life? As much as credit and debt renders everything calculable, converting subjectivity into a nothing other than a series of assets and risks, it does so behind one’s back (to echo Marx’s formulation about the constitution of abstract value). Money/debt implicates subjectivity in two heterogeneous and complementary manners: “social subjection” operates by a molar operation on the subject, taking its conscience, its memory, and its representations, while the “machinic control” operates by a molecular level, the infrapersonal and preindividual elements of subjectivity, which passes neither by the reflective conscience and its representations, nor by the self. When it comes to our wages, to the money in our pocket, we are interpellated as individuals, as consumers who can spend and realize our buying potential, but when it comes to debt, to the money that we are rather than possess, we are not individuals, but dividuals, divided and dissembled into constitutive acts and qualities, acts and qualities which are in turn grouped into larger aggregates and collections. The individual makes use of money, but at the preindividual level, the level of the dividual, the same person, or its component parts, is used by money. Despite the fact that debt is more or less deterritorialized, broken down in relation to abstract actions, qualities, and projections, and then assembled in collections, or securitized, does not mean that it does not reterritorialize itself in terms of concrete effects and relations. These effects are located most directly at the level of actions and choices, what Lazzarato refers to as the specific labor on the self demanded by the regime of debt. To take one example: student loans are relatively indifferent to the particular major or course of study one takes, an indifference made possible by the force of the state, but this does not keep the abstract quanitity of debt having an effect on an individuals concerned. Anyone who teaches at a University is perhaps aware of the chilling effect that student debt has an intellectual inquiry and education. Students do not ask themselves the questions: what interests me? And what discipline or field do I show talent for? But ask instead: what will get me a job? What will the market demand? Debt is the future acting on the present. Debts might be calculated at the level of preindividual actions, and transindividual collections, but it is internalized at the level of individual actions and decisions. As forgiving student debt, or the idea of an organized mass default of student debt circulates amongst members of the Occupy Wall Street movement, there are the seemingly inevitable invocations of responsibility. It is argued that those who took out student loans took their risks, decided to major in art history or philosophy, or, whenever offering relief to mortgage debt is proposed, it is argued that those who took out mortgages on houses they could not afford should not be rewarded. Debt is reterritorialized on the objects of nation and community, and subject to a hierarchy of acceptable objects and goals. The morality of debt is fundamentally anti-egalitarian: it is not just that there a debtors and creditors, but everyone has taken their chances, equality contradicts the morality of risk and reward. Debt is a mutation of homo economicus: it is no longer, as Marx argued, the subject of “freedom, equality, and Bentham,” but the subject of obligation, inequality, and Becker. 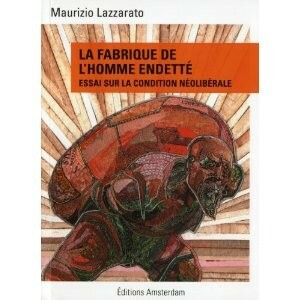 As Lazzarto argues, the entire economy of debt is implicated within a work on the self, in which the individual is governed by the idea of maximizing value and managing risks in a series of choices that are radically individuated, but what he does not mention is that the perception of these risks crosses the terrain of thoroughly moralized ideas of hard work, national, and communal belonging. It is precisely this moralization that any politics of debt, of debt refusal and debt, must actively refuse and combat. It must refuse it not simply as an ideology, as a set of ideas and representations that can be dispensed with, but as what Lazzarato refers to as a production of subjectivity. Debt and the calculation of life and activity in terms of risks and benefits are not just a set of ideas, they are a way in which subjectivity is produced and governed. Debt is not just a set of ideas one has about obligations, but an experience, a suffocating experience of what is possible or desirable. It “is a collective phenomenon suffered individually.” To say that it is a collective phenomenon does not mean that it constitutes a collectivity. It is difficult and tenuous to say “we debtors.” This is not just because of the moralizing divisions between homeowners, citizens, and students, but because the collective phenomenon is constituted more at the level of the preindividual dimensions of existence, patterns of risk, consumption, and other factors that do not constitute an individual. Debt is individualized at the level of guilt, but its collective conditions remain dispersed and disparate. Collective action requires a minimum of social solidarity, which is perhaps provided by the occupations of campuses and public spaces. As much as we might be critical of the spurious divisions between “Wall Street” and “Main Street,” financial capital and middle class, the very constitution of this movement suggests an inchoate awareness of a new antagonistic collectivity. Moving beyond the immediate connections formed by these actions, connections that still risk dividing debtors into good or bad debtors, will require a critical constitution of this collectivity. The starting point for the politics of debt is the current crisis, a crisis which undermines much of the conventional wisdom of the twentieth century, wisdom which claimed that consumer society would forestall any revolution in the developed capitalist countries. Debt, specifically housing debt, was initially, at least in the US constructed around an ideal of a nation of homeowners and college graduates, individuals who would be invested, both psychically and economically in the existing order. Debt works to conceal the shrinking wages and declining support of private education by postponing the due date to the future. Now, it has begun to create its opposite, a mass condition far more precarious than wage labor. Debt affects not just working conditions, or the possibility of finding work, but living, shelter, and ultimately, especially in the case of the student loans, the possibility of any future. In this uncertain future it is possible to glimpse two other things, which function as the basis for a politics of debt. First, is that debt is not just some way of affording a home, an education, a car, without cash, but it is the exploitation of these various needs, a way to make profit off all spheres of life and all relations. Second, debt exposes the idea of a neutral state, dealing with competing interests: it is not just that the state is on the side of the creditors, guaranteeing loans and garnishing wages, it makes their very existence possible. Thus it is possible to argue that as much as debt cuts transversally across the various transindividuations of citizen, student, and worker, it undermines two of the individuations that have forestalled political action: the consumer, too placated by mass marketed desires to act politically, and the citizen, caught up in the fictions of neutrality and equality before the law. Thus, while it is true that it is difficult to articulate the collectivity of debt, a difficulty made possible by its abstraction, it has perhaps cleared away the residue of the past. All that remains is the most persistent and difficult residue to dispense with, that of the responsible and isolated subject. The task of constituting collective refusal will be difficult, crossing the line between the abstractions of debt and concrete repression of the state, but one thing is clear the morality of debt, with its ideas of individual responsibility for a collective condition, must be refused at all cost. Greg, Thanks. (and thanks for the correction, I fixed it). I will also check out the Martin book, which I have not read. Great post! this is so informative, and helpful both for those who are currently facing debt and for debt collectors as well! Thanks for posting, i'll be sharing this to my friends. Hello Jason, my name is Theodor Saras and i made a translation of your post in Greek language. You can find it here. You describe the precious information about the Debt and its uses. Thank you so much for sharing this one. Very Good information about Debt you posted. Must need such useful information related to this topic.